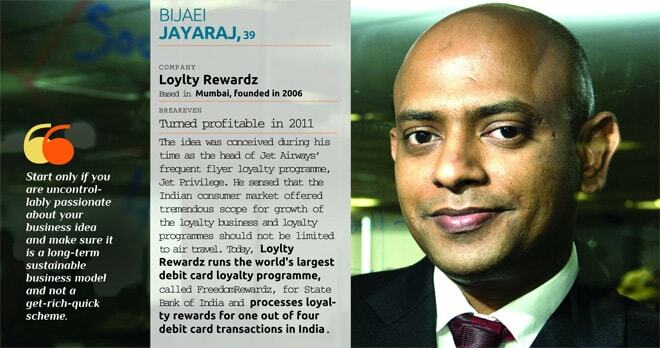 Bijaei Jayaraj, 39, was well-placed in the corporate world, heading Jet Airways' customer loyalty rewards programme. Most people would have been content with a career like his. Not Jayaraj. 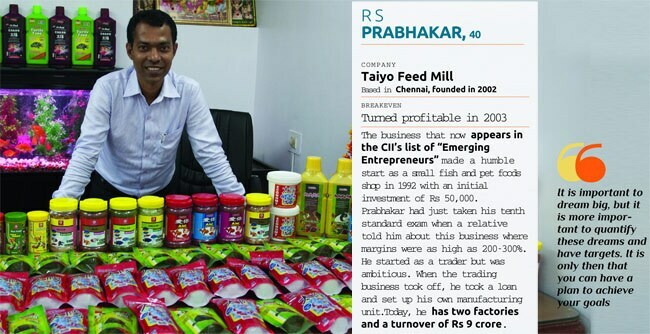 This Indian School of Business graduate wanted to spread his wings wider and become an entrepreneur. Jayaraj sniffed an opportunity while still working for Jet. "I felt that in India there was scope for extending customer-loyalty programmes beyond air travel," he says. "I believed India offered tremendous scope for growth of the customer-loyalty business. So little was done, and there was, and still is, so much more that can be done," he says. In 2006, Jayaraj quit Jet to set up Loylty Rewardz Management*. That, as they say, was just the beginning. After working on the project for two months, he realised he didn't have enough resources to build a successful business. Once Jayaraj realised that the venture would not be a success with the limited resources available to him at that stage, he didn't hesitate in taking up a job again, this time with MasterCard Worldwide. However, he kept working on the business plan and the pitch to venture capitalists. After two years, the plan was ripe enough to attract VenturEast, a venture capital fund. In 2008, Loylty Rewardz went ahead with top speed, and has not looked back since. Today, it manages customer loyalty programmes of over 175 million credit/debit cards for clients like State Bank of India, Punjab National Bank and Citibank. Jayaraj is part of the growing population of entrepreneurs seeking freedom from regular jobs and setting up own businesses. If you, too, hate working for others and have an idea for a marketable product or service that you are passionate about, it is a good time to start your own venture. Studies by the World Bank's International Finance Corporation say India is one of the toughest places to set up and run a business . However, this has failed to deter entrepreneurs, for various reasons. "As capital becomes more easily available through angel investors and venture capitalists, more and more people are setting up own businesses. Support on the capital front was missing a few years ago," says Alok Mittal, managing director, Canaan Partners India, a venture capital firm. 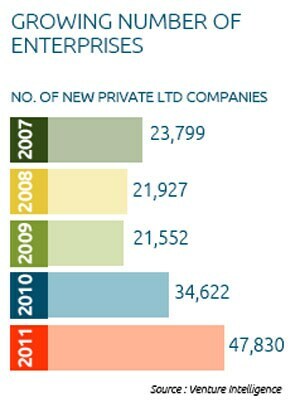 A large number of these new entrepreneurs are freshers with zero or limited work experience. For instance, Shaifali Agarwal, 26, started EasyFix, which provides plumbing, electrical and other repair services in the Delhi-National Capital Region, in 2011 after working for three years with a company. The reason for this is simple. The opportunity cost of turning an entrepreneur is low at the early stage of a person's life and career. "The zeal to quit job and become an entrepreneur can be seen more at the fresher level than the mid and top level. As one rises up the corporate ladder, the opportunity cost of starting a venture goes up. It's difficult to give up the comfort of a good salary," says Bharati Jacob, cofounder and partner, SeedFund, a venture capital fund. However, some experts say that those at the top rung find it easier to go solo as they are better equipped with experience and support network, which are big assets for any business venture. According to the dictionary, anyone starting or running a business is an entrepreneur. However, the connotations of 'businessman' and 'entrepreneur' are starkly different. "Entrepreneurship means solving problems and adding value to the existing system through products and services, whereas a business is the mundane process of earning revenue and profit," says Jacob. For instance, you can free yourself from your nine to five job by becoming a freelancer or a consultant, but that may not give you wide acceptance as an entrepreneur. For that, you must add value to the market with your product or service. Many institutions teach entrepreneurship but at the end of the day you still have to come up with your own idea, which is usually the most difficult part. Apart from exploring the surroundings for this, you must also look at personal experiences. What matters is the ability to identify a market for a new product or service. "One question you should ask is, what do you need as a consumer? It is fair to assume that in a country of over one billion people, a number of people will be facing the same problem or desiring the same product," says Jacob. 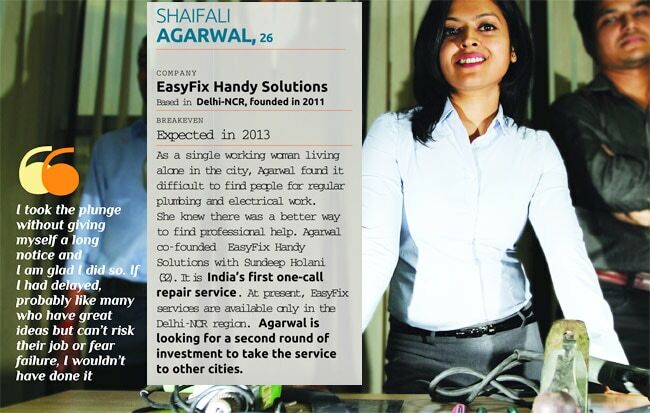 Agarwal of EasyFix found an opportunity in the problems she faced as a single woman. "I had a tough time finding a plumber. After that, a lot of time was wasted in waiting and making follow-up calls. I thought why can't there be a professional service for such repairs?" says Agarwal. 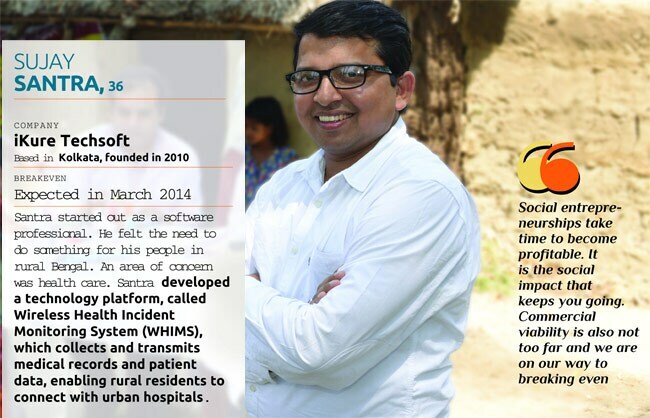 Another entrepreneur, Sujay Santra, thought of using technology to make affordable health care available in villages. Santra set up iKure Techsoft to create an information technology-based platform to connect rural areas with urban hospitals. "My roots are in a village. I felt the need do something for my people. Rural areas are suffering an acute shortage of quality health care and services," says Santra. iKure serves rural India through a network of remote centres connected with big hospitals using a proprietary software developed by it. It charges Rs 80 from patients for consultation and medicines. iKure also makes money by selling data collected by its network and charging other health-care institutions that use its software. The first step is spotting a gap in the market. Once you do that, it's time to start the groundwork for taking the plunge. The first step is to study the market and refine the idea. Experts say it's best to test the market at the concept stage itself. "Accurate assessment is a must. A lot of energy needs to be put in to find out if there is demand for your product/service," says Mittal of Canaan Partners. Identify a few customers with whom you can share the idea. Seek their opinion and ask how much they will be willing to spend on your product/service. However, a market survey at the concept stage will not give you a very clear picture. "Though such surveys can be used for initial study of the market, they don't always elicit the correct responses. A responder is more likely to give a favourable response at this stage," says Jacob. "The response will be more realistic if you ask him to buy the product," she adds. Priya Mohan, co-founder of career discovery programme Vidyartha.com, devoted ample time to prepare for her venture with Navin Balan. Before starting the company in 2011, Mohan was an investment banker and Balan a senior executive with an information technology firm. "While in our jobs, Navin and I spent 10 months doing research and groundwork for the venture- understanding the market, people's willingness to pay, the nature of the demand, competition, capital requirement, etc," says Mohan. Though the hard work that goes into the pre-launch research helps in the basic preparation, you can still be surprised by many aspects of the business when you hit the ground. The real testing happens after you make your product (or its prototype) available in the market- the proof of concept stage. You will have to make some tough choices on how to proceed, depending upon your personal/professional ambitions. "At a personal level, you need to ask, why do you want to become an entrepreneur? And, do you want to have a boutique firm or a large company?" says Jacob. "For example, if you want to enter the food business, do you want to run just one restaurant or a chain across cities? Do you want to take up the task of building a large set-up and overseeing activities at multiple locations?" she says. You also must seek mentoring. "It's good to find a mentor or a guide in early stages," says Jacob. For this, reach out to successful entrepreneurs. Even if the mentor is not working in the sector that you wish to enter, you can learn a lot from his or her experience. Mohan of Vidyartha.com and her partner tapped into their social network for support. "We were fortunate to be networked to a lot of mentors across industries. At every point we met these experienced people and got as much advice about business, scale and markets as possible. We used that to make decisions," she says. Professional set-ups such as entrepreneurial networks and incubators also provide mentoring. As you will be sharing your idea with a mentor at an early stage, choose your guides wisely. Also, the new venture will require funds. Many people use own savings. If you do not have enough funds, don't worry. 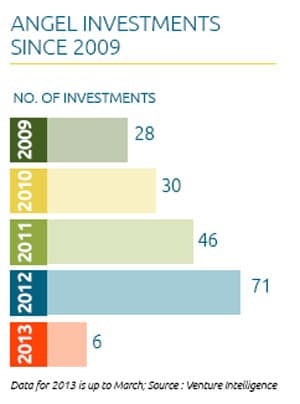 India now has a number of angel investors and venture funds who invest in promising ideas. These funds have their own parameters such as scale, business stage and sectors to measure the suitability of a proposal. For instance, Canaan Partners invests in start-ups which have the potential to become large companies. "The underlying market should be large; the team should be able to scale up the business; and there should be a differentiator (in product/service) so that the business cannot be easily replicated by competitors," says Mittal. So, find out investors who fund ideas similar to yours. Aspiring entrepreneurs faces a choice-to jump into action at once or start out while retaining the job. There are many success stories of people who started their ventures while enjoying the stability of a regular salary. But mentors don't recommend it. "You must start the venture as a full-time business. Being an entrepreneur is a 24X7 job," says Jacob of SeedFund. This allows you to devote all your energy and time to the business, which is so critical for the success of any venture. Another question that is often asked is-should there be a back-up plan? Successful entrepreneurs and mentors say it's an obstacle. "There cannot be any plan other than the start-up. You must have only one plan as it won't work if you seek the comfort of an alternative option. You must have confidence in your plan and take the risk," says Jacob. Jayaraj of Loylty Rewardz has the same opinion. "I believe in not making back-up plans. In fact, you must systematically cut out all alternatives so that the only option is to succeed," he says. When you start the new journey, you need to be ready to tweak and evolve your plan to overcome the unexpected obstacles you might face in the real world. These might be things you didn't have any clue about. Jaisinghani of Mera Gao Power, too, found surprise obstacles in his journey towards providing power in villages. "Initially, we didn't realise how difficult it will be to collect revenue. We had to learn a lot of things," he says. That's why angel investors and venture capitalists invest in teams that show willingness to evolve and adapt. "An entrepreneur should have the ability to learn from the market situation and flexibility to modify the product and business plan accordingly. It's a sharp learning curve from the time you enter the market," says Jacob. The risks associated with new ventures cannot be eliminated. Even established businesses falter, but they adjust their products and strategies based on the market reality. You need to expose yourself to acquire survival skills. "Unless you learn by burning own money, no theory will help you take decisions as an entrepreneur," says Mohan of Vidyartha.com. You need a good plan, but it doesn't have to be perfect. Investors funding new ventures favour starting out and not subjecting the plan to prolonged scrutiny. "If you have an idea, you must start out as soon as you can. Don't suffer from analysis paralysis. You can always alter your plan at a later date," says Jacob. It may take some time for your venture to start making money. Remember that you will have to manage your household expenses and other liabilities without salary during this period. Start by evaluating your cash flow and investments. Those with regular income are advised to have an emergency fund to meet expenses for three-six months. Entrepreneurs need a bigger fund. "Building an emergency fund is the most important aspect of financial planning. It is advisable to save for six to 12 months of expenses," says Nitin Vyakaranam, founder and chief executive, ArthaYantra, a personal finance adviser. Before quitting the job, it's best to arrange a regular income source. "This will ensure financial stability during the start-up phase. The income can come from investments or spouse's earnings," says Anil Rego, founder and chief executive officer, Right Horizons, a financial advisory firm. You can use financial products that have high liquidity such as fixed deposits, bonds and debt and gilt mutual funds for meeting your requirement of regular income. "One can put savings in systematic withdrawal plans for regular income as well," says Vyakaranam. Rental income can also replace salary. A big exposure to stocks is not recommended due to the risk involved, but one can retain 10-20% savings in equities at this stage. "One must move savings to debt and return to equities after the business picks up," says Rego. Uncertainties of life such as death, diseases and accidents can impact your business if they force you to dip into personal/business funds. Financial advisers say entrepreneurs must get adequate insurance to cover risks, especially when they have a young venture to nurture. Plan for the worst and buy insurance accordingly. "The key purpose of life insurance is to make provision for future expenses in case of untimely death of the bread-winner. Your expenses will not change when you leave the job. So, you don't need any change in insurance covers if they are adequate," says Pankaj Mathpal, a Mumbai-based certified financial planner. An individual's insurance requirement depends upon various things such as age, number of dependents, liabilities and, most important, life's milestones, says Sunil Mishra, chief executive officer, Karvy Private Wealth. After leaving the job, one loses benefits such as life, medical and personal accident covers. Also, being self-employed makes one open to risks such third-party liabilities arising due to negligence and injuries. "One has to understand these changes and take protection," says Mishra. If you intend to borrow money for starting your business, it will also have to be factored in while deciding the insurance cover. You should also get your business establishment insured. "It is advisable to separate your personal and professional insurance covers. It is a good practice to insure inventory against natural calamities or damages. You should also get insured against losses due to factors such as interruption in power supply," says Vyakaranam of ArthaYantra. "Most salaried individuals rely on the health insurance provided by their employer. If your spouse's employee health insurance doesn't cover you adequately, you must buy a health cover for yourself and your dependants," says Manavendra Prasad, head (product marketing), Fullerton Securities and Wealth Advisors. Loans and liabilities should be cleared before the enterprise is launched. It will make the business more stable and allow you to secure fresh loans for venture. You can also prepay a part of your loans and get them restructured to reduce instalments. "You can ask your lender to reduce the monthly instalment not just by reducing the principal outstanding through pre-payment but also by extending the loan tenure. The opportunity to transfer the outstanding loan to a different lender for a reduced rate of interest should also be considered," says Prasad of Fullerton Securities. In case you are unable to repay your loans in full before starting the business, make provisions loan instalments. You should also keep separate bank accounts for personal and business purposes. The same should be strictly followed with account books as well. "No matter how much you plan, there is always a time when you have to be on the edge to balance your personal and business finances. Maintaining a separate account for regular household expenses helped us in sticky situations," says Santra of iKure. Entrepreneurship also teaches you to be frugal-both at the business and professional level. You are forced to live on reduced income without knowing how long it will take for you to earn a regular income. Cutting expenses and spending money wisely is the only option for most new entrepreneurs. "My wife works and we lived off of her income for the first three years while I was unsalaried. We had to live within our small budget," says Jaisinghani of Mera Gao Power. Being an entrepreneur requires conviction and resilience. There might be times when you are overwhelmed by fears and challenges. Still thinking? If you want to become an entrepreneur, there's no better time than now. SeedFund's Jacob advises that one must not procrastinate. "Start your venture as soon as you can; start today; start this very moment itself. When turning an entrepreneur, the journey and learning is a huge reward in itself," she says. *The article has been updated to correct the name of Bijaei Jayaraj's company - Loylty Rewardz. The error is regretted.